Choosing hardwood floors for your home can increase its value as well as give it a refined look and feel that you will enjoy for many years. Depending on the type of foundation and sub-floor you have installed, you can choose between several hardwood flooring materials. Traditional crawlspace or homes with basements typically have wooden joists and sub-floors. With a wooden base, you can install any variety of hardwood flooring material, including thick tongue and groove hardwoods that must be nailed down. For homes with concrete slabs or similar sub-flooring, your options are typically limited to engineered hardwood flooring products that are generally thin wooden veneer with a hardboard backing that can be installed on any floor. Since we are on a slab foundation, we are utilizing the engineered hardwood to achieve our flooring needs. Hardwood floors are among the popular choices for homebuilders and renovators because they have the classic look, which goes with any style or d�cor, and are generally easy to maintain. When in the market for this particular type of flooring, a buyer should consider various things. Perhaps on top of the things most people take into account when buying any product is the price. It is one thing to set and follow the budget for the flooring; it is another to get good quality floors and still stay within the budget. Hardwood floors can be more expensive compared to other flooring options because they are, in general, very durable and long lasting. Shopping online, browsing, and comparing quotes from different online stores is one clever way to do it. Most stores offer tons of discounts and promotions for customers to grab. The site's subfloor needs to be flat enough to make sure the main floor is going to get the support necessary. Consulting professionals about this matter would be sensible. They will be able to tell whether the subfloor is ready for the floor installation. If not, they can offer guidance and advice. Choosing the type of the hardwood flooring to be installed can be very vital, it is one factor that needs further consideration prior to installation as it may have valuable effects on the quality of the floor. Engineered hardwood flooring is less costly and ecological. The wood layers that construct it does not purely consist of ornamental wood: the top layer which, is chosen by the buyer for aesthetic purposes, and the layers underneath that are made up of cheaper wood scraps. The price of installation for engineered hardwood flooring is not as expensive as of its other type. The installation also takes less time. The options of rooms where engineered hardwood floors can be installed are also more extensive as it is not as sensitive as the solid hardwood when it comes to moisture or humidity of the environment. One other advantage of this type is that it is more convenient for remodeling or renovations with the "floating" method of installation that does not require nails or adhesives. A disadvantage of engineered hardwood flooring is that it cannot be refinished. The most common type of solid hardwood flooring is red oak. The standard size is 3/4" thick by 2 1/4" wide. Solid Hardwood flooring is also available in various sizes from three to six or more inches wide (called plank floors). The other common types of hardwood flooring available are Oak Hardwood, Maple Hardwood, and Bamboo. Solid hardwood will more likely last a lifetime for some people, as it is possible to refinish this type of flooring. 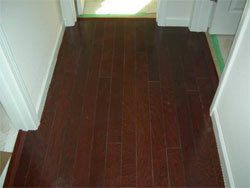 Hardwood finishing is a process done to a wood surface to provide protection and to enhance its appearance. Hardwood products may be purchased as unfinished or prefinished. Although buying unfinished hardwood floor can be considered a bargain, this require longer installation time because this product still needs to be finished on site regardless of the hardwood type. This may take a few days to a week to complete and the sanding process can be very tedious, not to mention dusty. If there is a restraint on time, it is not advisable to opt for unfinished hardwood flooring. On the other hand, a more suitable and a more common option nowadays available are prefinished hardwood floors. They are factory processed and coated with strong and even UV or waterproof finish. This ensures quality finished flooring and eliminates the factor of time-consuming labor, as buyers no longer need to be bothered by the lengthy process anymore. It is also a great option if you are putting down hardwood in one room of a house that is being lived in, because you avoid the dust and fumes from the polyurethane creeping into the rest of the home. Relatively, purchasing prefinished hardwood may be valued more than unfinished hardwood. Like any other decision making process, the key to coming up with the most appropriate conclusion is dependent on the information and knowledge one possesses. Researching about hardwood flooring, be it online, personally, or with the help of professionals, will give buyers an edge and will make shopping a lot easier.